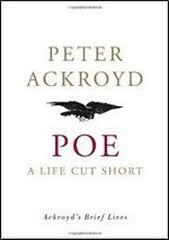 Early in his biography, “Poe: A Life Cut Short,” Peter Ackroyd relates that, a few weeks before his death, Poe had admitted “I do believe that God gave me a spark of genius, but He quenched it in misery.” After reading this short biography (only 140 pages), I would have to agree. Ackroyd has also written a well-received biography of Charles Dickens, and it was actually that book I was looking for when I stumbled upon this Poe biography. I went ahead and read it first, as I’ll admit I like to follow “the hand of fate” whenever it presents itself to influence what i’ll read next. I’m so glad I did, as I learned a lot about this famous author (1809-1849). I was surprised and saddened to discover what a struggle his life had been, not knowing he had spent most of it destitute (and I mean REALLY destitute) and had actually earned most of the little money he did earn through his work as an editor rather than a writer. The estimated total amount he had actually earned from his books – in his entire life – was less than I earn in average day. Admittedly, this does not allow for the change in the relative value of the 19th century dollar to that of the 21st century one, but we could change it from a day to two or three months and it remains a pitiable fact. Another common thread in the biography was that Poe’s life was strewn with women he lost to (often premature) death. His own mother, his de facto adopted mother, and his young wife later in his life. Echoes of these losses reverberate through his work, and in all likelihood greatly influenced the morbidity and horror that suffuses his most famous tales and poems. I was reminded also of Poe’s great influence over subsequent literature. His stories, The Purloined Letter, and Murders in the Rue Morgue are universally acknowledged as the birth of the detective story in literature. His stories of fantasy are thought to also have influenced those patriarchs of science fiction, Jules Verne and H.G. Wells. And his poetry remains influential to this day. Quite a legacy for one man, wouldn’t you agree? Particularly one who died when he was only forty years old! My old book club once devoted a meeting to several of his short stories and poems, and it remains one of my favorite meetings that we ever had. What are your thoughts about Poe? Are you also a fan, or is he too macabre for your tastes? Always a fan of Poe’s writings! Was any mention given to Poe’s work in cryptography in Ackroyd’s biography? Funny, I had never made the connection between his morbidity and themes of death with CRYPTography. Thanks for commenting. 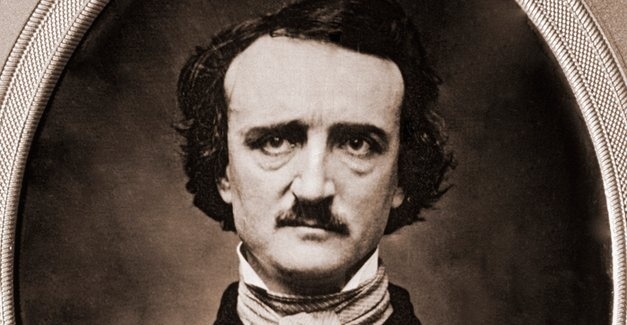 He did touch upon Poe’s fondness for cryptograms and ciphers, albeit briefly over just a page or two. Noting that “Poe prided himself on his intimacy with the secrets of cryptography,” and that he “boasted to a friend that nothing intelligible could be written which, with time,I could not decipher.” Ackroyd speculates that Poe’s fondness for unravelling secret things may have had something to do with his father’s disappearance whenPoe was but a boy. I suspect,personally, it just has more to do with Poe’s predilection for language in general. I’m reading The Murder of Marie Roget this week and was recently thinking that I should find a decent Poe biography. Hand of fate, indeed! I am a superfan of E.A. Poe. The man fascinates me. His mind scares me! This was an excellent and touching review of his biography. I will put Ackroyd’s book on my #MustRead list. Poetry: I love to read it outloud…just to my self, especially The Raven!